Coq au Vin... day two. 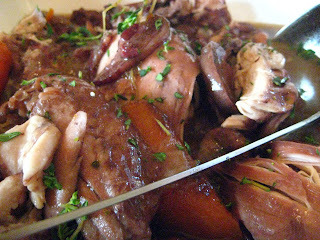 Coq au Vin... according to me. Whether due to wine or exhaustion, my mind was buzzing with the various things that you could do with the Coq au Vin on its second and third and fourth days. Slicing a baguette on the diagonal, so you have long slender platforms. Rub each piece with raw garlic. Both sides! Lay the slices on a baking sheet. Drizzle with olive oil (just a touch). And crisp slightly in a 250 - 350 F oven. Make an open face sandwich. Using some nice bread, top with Coq au Vin (reserving the juices, so your bread doesn't become a sponge), cover with slices of brie or swiss or gouda or whatever cheese makes your mouth water. Set under the broiler or in the toaster oven for a few minutes, until the cheese is bubbling and, hopefully, colouring slightly. What else?? Yay, alliteration! hahah. Apparently, poached fruit is a tradition at Ukrainian Christmas dinner (as my Momma told me at dinner that night)… though, I was ignorant of this when I decided to tackle this recipe, I was thrilled that this “test run” could be seen as great foresight and impressive culinary work. Or something. hah. This is a recipe that I have wanted to try for so long… but I have to say that I was completely intimidated. Now that I have done it, I’m annoyed that I never took the chance sooner, as it is so EASY! And, I mean easy… it’s almost the same amount of work as the tabbouleh. So, if you tried that recipe, you’ll realize that this dessert is equally attainable and not be put off giving it a test run of your own. Think of this like a Christmas sangria! You’re wondering where I got the reference… well, in this recipe, basically, you make a mulled wine, then cook your fruit. Any of us can handle that. You could also make two pots of the wine, one for your pears and one for you. Now, that’s my idea of good cooking. As much as I am a foodie, I am a realist too… somewhat. I’ve fallen into the trap of buying really good vanilla, but I know that the likelihood of my stocking allspice berries or cardamon pods is slim. Just use what you have, add what flavours you enjoy… you can’t go wrong. This couldn't be easier to make... or more impressive sounding. It's a beautiful chicken (traditionally, rooster) stew and requires very little fuss beyond choosing some high quality ingredients. The prep time on this was less than 20 minutes. (And it is probably fair to say that I wasn't working too quickly.) After that, like any stew, you can decide how long you would like to cook everything together. Obviously, as all of the ingredients have a chance to hang out and ask the other for a date, the flavours will mingle and intensify. You can easily make this recipe in advance and heat it gently before you are ready to serve. It's all up to you!